Do you know what the top 5 most requested items are this year on every kid’s Xmas wish list? I guess that depends on your age (or how old your children are). If you have young children than you’ll probably recognize at least 1 or 2 of this year’s most popular items. If you have teenagers than I imagine the usual laptop, iPhone and video game requests are still par for the course. Did you ever wonder what it would have been like to be a parent 50 or 100 years ago? What types of goodies children wanted from Santa way back then? I found something on the internet that I thought was very interesting; it was the Xmas list of a child in 1913. 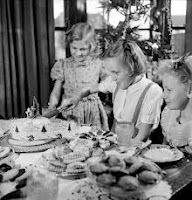 I’m willing to bet that children were every bit as happy on Christmas morning back then as they are now, maybe even more. I think today’s children have so much to choose from that even the biggest list wouldn’t scratch the surface. Please don’t misunderstand me. I’m not saying that there’s anything wrong with a child getting a sleigh full of goodies on Xmas morning but sometimes I think that the true meaning of Xmas has gotten lost in all the glitter and shine. I remember my parents telling me what Christmas was like when they were little. I remember my grandparent’s stories as well. It seemed like the holidays were more about “people” and less about “things”. Back then there wasn’t a Facebook (or good ole’ My Space) to stay in touch and cell phones were a distant dream. The holidays truly were a time to see family and friends that you had not seen since the year before and food was the best gift of all. They truly were simpler times. No sneaky midnight visits to Toys-R-Us or trying to find that “must have” toy that has already sold out. No spending hours and hours trying to wrap all of those gifts that Santa’s elves worked so hard to make; just some essentials, good food and good times. This year’s 5 most requested gifts from Santa are (starting with #1) Furby Boom, Teksta Robotic puppy, LeapPad Ultra, Flying Fairy and Bug Hugs Elmo. In 1913 the number 1 most requested gift by children was candy followed by nuts, a rocking horse (remember them? ), a doll and finally, mittens. Times sure have changed. May everyone reading this have a happy and safe holiday season.